There’s nothing like waiting until the very last minute to check off that final to-do on your 2013 new year’s resolutions list. 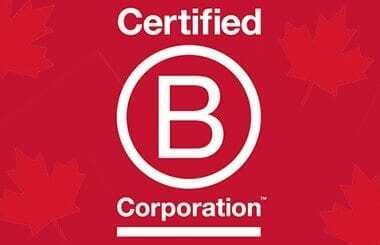 For 2013, the B Corp team within the MaRS Centre for Impact Investing had committed to seeing the total number of Canadian B Corp certifications reach the century mark and, evidently, we paced ourselves perfectly. Starting things off early with the certification of MaRS client ChangeIt and wrapping things up with a flurry of activity on December 31, 2013, we saw the total number of Canadian B Corps grow by nearly 65% in 2013 (from 61 to 100) and stretch across Canada from east to west, with representation now hailing from Nova Scotia, Quebec, Ontario, Manitoba, Alberta and British Columbia. These 100 Canadian B Corps represent over 10% of the 910 global B Corps across 60 industries in 29 countries and they’re currently the largest cluster outside of the United States. Joyce Sou, MaRS CII’s benefit corporation manager, remembers her first Greater Toronto Area B Corp gathering in 2011. “We could all fit around a table at Mercatto,” she says. Barry Martin, principal of Hypenotic, a founding Canadian B Corp, was around the restaurant table with Joyce in 2011. His reflection has really helped to put this milestone in perspective: “When there’s one of you, you’re an anomaly. When there are 10 of you, you’re the fringe. When you get to a hundred companies, you’re into movement territory,” he says. Here are some thoughts on B Corp from (some of) the class of 2013. — Ryan Taylor, Fair Trade Jewellery Co.
— Steve Beauchesne, Beau’s All Natural Brewing Co. In 2014, the MaRS Centre for Impact Investing will continue to work with executives, owners, employees, shareholders, pensioners, voters, taxpayers and governments to demand quantifiable measures like B Corp certification and then build, hire, apply, trade, invest, advocate and buy accordingly. Together, we will redefine success in business. Interested in learning more about B Corps and impact investing? Join us at MaRS on Tuesday, March 18, for Impact Ontario, a landmark conference that brings world-changing Ontario ventures together with world-leading investors and intermediaries. If you’re interested in the ever-growing field of impact investing, this is the event for you! Registration is now open! @BCorpCanada is always open for introductions to “good” Canadian businesses, so don’t hesitate to follow, favourite and re-tweet us!